The Isaacson lab just published a paper about feedback connections from piriform cortex to the olfactory bulb. To do this, they expressed ChR2 in cortex, then cut slices of the olfactory bulb, patched various cells, and photostimulated the cortical axon terminals. Standard optogenetics in 2013. They quantified the strength of the cortical feedback onto various cell types, and they found that the EPSCs were stronger onto one cell type, deep short axon cells (dSAC), than another cell type, granule cells (GC). Curious to know whether the dSAC current was larger due to convergent input from multiple fibres, or simply because individual synapses were stronger, they employed a new technique: minimal optical stimulation. 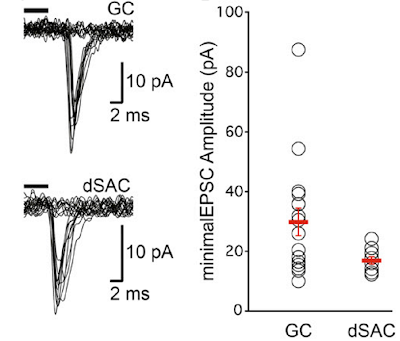 Photostimulation of cortical fibres yields larger currents in dSACs (~300 pA) than GCs (~30 pA). From Boyd et., al., 2012. Before writing about minimal optical stimulation, a brief history of minimal (electric) stimulation. I did some Google Scholaring, and it appears that the first paper to use minimal stimulation was from McNaughton, Barnes, and Anderson in 1981. McNaughton was interested in the strength of synaptic connection onto granule cells in the hippocampus. As they note, "While there exist abundant anatomical data on numbers and kinds of afferent fibers making synaptic contact on many types of neuron, these data are, in only a relatively few cases, matched by quantitative physiological data on the efficacy of these synapses..." Given all the recent discussions about the utility of the "connectome," it is interesting to see the same questions being asked thirty years ago. McNaughton wanted to measure the synaptic currents of single fibres, but the fibres were too small to be isolated at the time. To attack the problem from a different angle, they patched a cell, then placed a stimulating electrode in the fibre bundle, and gradually increased the strength of stimulation. For some stimulation locations, they saw a gradual, ramped increase in the evoked current, presumably due to recruitment of increasing numbers of fibres (below left). In other cases, they saw a step-wise increase in synaptic current, which remained steady for above-threshold stimulation (below right). The step-wise increases were presumably due to the recruitment of single fibres. 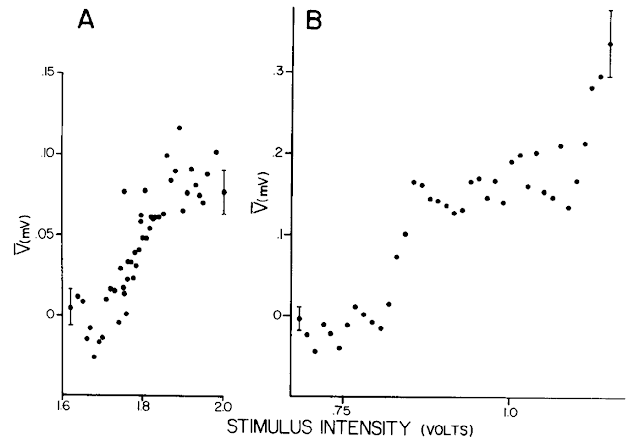 Gradual increases of stimulation intensity can either cause a gradual increase in synaptic potentials (A), or step-wise increases in synaptic strength (B). From McNaughton et. al., 1981. Thus (I believe) was born minimal stimulation: the stimulation of fibres at low intensity (and with high failure rate), such that you probably are only stimulating a single fibre. The moniker "minimal stimulation" itself was not widely used until ~1990 when Malenka, Richard Tsien, and Charles Stevens published a few papers using the technique. In these experiments, we reduced light intensity to the point at which clear failures of synaptic responses were observed on > 50% of trials and we measured the average amplitudes of successes in each cell... The average amplitude of the single-fiber EPSC was actually somewhat larger for inputs onto GCs compared to dSACs (29.8 ± 4.6 pA and 17.0 ± 3.8 pA for GCs (n = 17) and dSACs (n = 10), respectively; K-S test, p = 0.04). 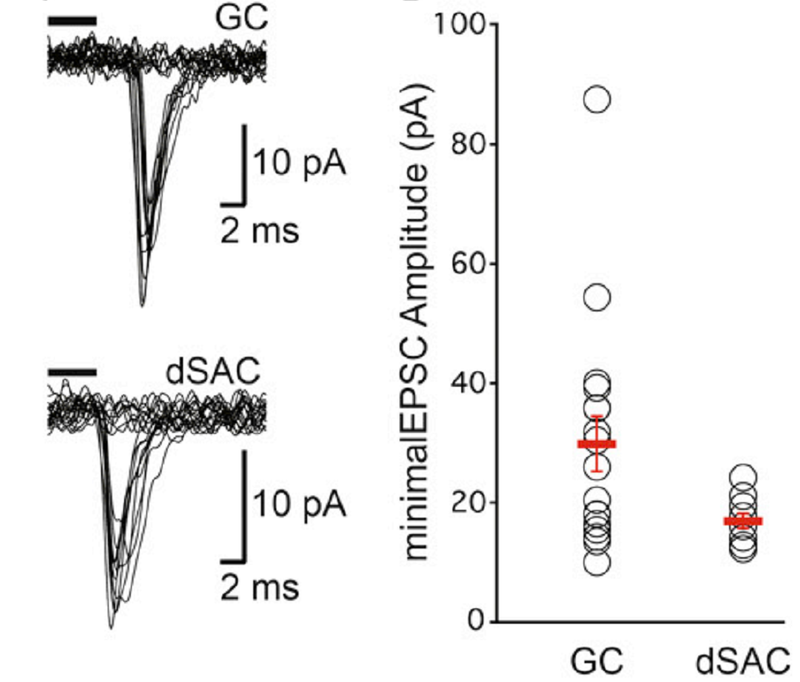 Together, these data suggest that dSACs receive stronger excitation than GCs due to a higher convergence of feedback inputs. Minimal optical stimulation of GC cells show they have a larger single fibre current than dSACs. From Boyd et. al., 2012. 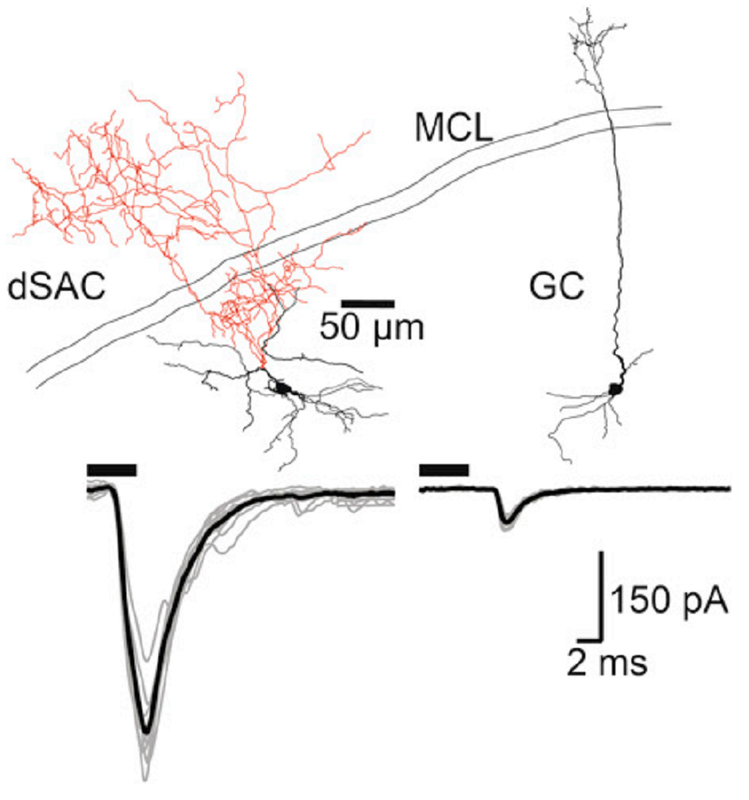 While they did not quantify this, the similarity between the "full" and single fibre currents onto GC cells imply that they receive cortical feedback from just one neuron. In contrast, dSACs could receive cortical feedback from up to twenty different cortical cells. I do have a few questions regarding this result. First, and trivially, why did they use a K-S test instead of a t-test? Did the variability of the GC EPSCs mess up the t-test? Second, to what degree is the minimal optical stimulation reliably activating the same cortical fibre? For GCs, it is clear that they are receiving input from just a few fibres. For the dSACs, where the cells are presumably receiving input from multiple fibres, it seems possible that each photostimulation could activate a different fibre. If this were true, minimal optical stimulation would not be measuring single fibre conductances, but rather, the average single fibre conductance. You might be able to detect this by comparing the variance of the GC conductances to those of the dSACs; if the minimal optical stimulation was stimulating different fibres, you would expect the variance to be higher. Finally, given this single result, I am unclear on what role multi-vesicular release could be playing at the dSAC synapse. It seem possible, if somewhat unlikely, that dSACs receive input from just a few fibres, but that each fibre has a high dynamic range, and is able to release multiple vesicles. I wonder how this technique could be improved. Like with minimal electric stimulation, with minimal optical stimulation you never know which axon or synapse your activating. However, it is much easier to move a light spot than an electrode, so it should be possible to reduce the area and vary the location of photostimulation to reduce the potential number of fibres. Of course, if your photostimulation is so precise you can identify the actual axon you are stimulating, it no longer is a minimal stimulation technique, but targeted stimulation of individual fibres. This may still be useful given the problems with 2-photon stimulation of channelrhodopsin. In any case, I thought minimal optical stimulation was a nice blend of an old method with new technique. Minimal electric stimulation is still in wide use today, and perhaps minimal optical stimulation will soon be as well. Hopefully someone will more extensively explore the potential of this technique. Hey man, big fan of the blog. You should check out Franks et al., a Neuron paper From Richard Axel's lab, they use this technique there. Right you are! I have updated the post to reflect that.